It is founded on broad-based principles that make possible the use of new materials and new building designs. 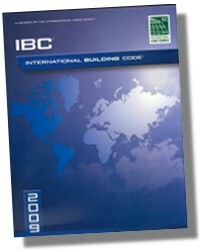 The International Building Code® (IBC) is a model code that provides minimum requirements to safeguard the public health, safety and general welfare of the occupants of new and existing buildings and structures. 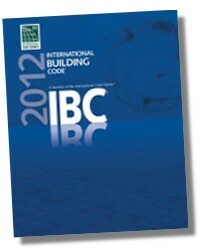 The IBC is fully compatible with the ICC family of codes, including: International Energy Conservation Code® (IECC®), International Existing Building Code® (IEBC®), International Fire Code® (IFC®), International Fuel Gas Code® (IFGC®), International Mechanical Code® (IMC®), ICC Performance Code® (ICCPC®), International Plumbing Code® (IPC®), International Private Sewage Disposal Code® (IPSDC®), International Property Maintenance Code® (IPMC®), International Residential Code® (IRC®), International Wildland-Urban Interface Code™ (IWUIC®) and International Zoning Code® (IZC®). The IBC addresses structural strength, means of egress, sanitation, adequate lighting and ventilation, accessibility, energy conservation and life safety in regards to new and existing buildings, facilities and systems. The codes are promulgated on a 3-year cycle to allow for new construction methods and technologies to be incorporated into the codes. Alternative materials, designs and methods not specifically addressed in the code can be approved by the code official where the proposed materials, designs or methods comply with the intent of the provisions of the code (see Section 104.11). The IBC applies to all occupancies, including one- and two-family dwellings and townhouses that are not within the scope of the IRC. The IRC is referenced for coverage of detached one- and two-family dwellings and townhouses as defined in the Exception to Section 101.2 and the definition for "townhouse" in Chapter 2. 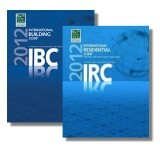 The IBC applies to all types of buildings and structures unless exempted. Work exempted from permits is listed in Section 105.2. CHAPTER 1 ADMINISTRATION - Chapter 1 establishes the limits of applicability of the code and describes how the code is to be applied and enforced. Chapter 1 is in two parts, Part I-Scope and Application (Sections 101-102) and Part 2-Administration and Enforcement (Sections 103-116). Section 101 identifies which buildings and structures come under its purview and references other ICC codes as applicable. 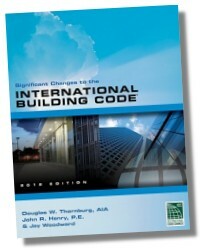 Standards and codes are scoped to the extent referenced (see Section 102.4). The building code is intended to be adopted as a legally enforceable document and it cannot be effective without adequate provisions for its administration and enforcement. The provisions of Chapter I establish the authority and duties of the code official appointed by the jurisdiction having authority and also establish the rights and privileges of the design professional, contractor and property owner. CHAPTER 2 DEFINITIONS - All terms that are defined in the code are listed alphabetically in Chapter 2. Terms are defined in Chapter 2 or there is a reference to the section where the definition is located. While a defined term may be listed in one chapter or another, the meaning is applicable throughout the code. Codes are technical documents and every word, term and punctuation mark can impact the meaning of the code text and the intended results. The code often uses terms that have a unique meaning in the code and the code meaning can differ substantially from the ordinarily understood meaning of the term as used outside of the code. Where understanding of a term's definition is especially key to or necessary for understanding a particular code provision, the term is shown in italics wherever it appears in the code.